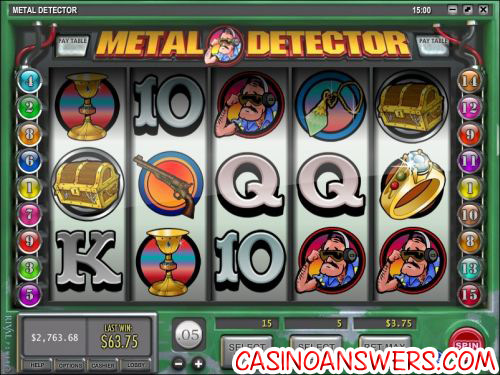 Metal Detector Video Slot Guide & Review - Casino Answers! Metal Detector is a 5-reel, 15-line video slot developed by Rival, featuring scatter wins, a free spins feature and two bonus game. You can play the Metal Detector video slot at Rockbet Casino and Pantasia Casino. Metal Detector opens up with a man on a beach using a metal detector to look for treasure. Suddenly, it starts beeping and the camera pans underground to reveal the Metal Detector logo. You can hear seagulls and other sound effects you would hear at the beach while you play the Metal Detector video slot. Symbols on the Metal Detector video slot are Treasure Map (scatter symbol), Detector Dude (bonus symbol), Gold Coin, Treasure Chest, Diamond Ring, Revolver, Necklace, Watch, Gold Cup and Ace, King, Queen, Jack and Ten symbols. For a look at the Metal Detector video slot from Rival Gaming, a screenshot is below. Coin sizes on the Metal Detector slot machine are $0.01, $0.05, $0.10, $0.25, $0.50 and $1. You can bet 1-5 coins per line and play up to 15 lines. The lowest total bet you can make on the Metal Detector online slot is a penny per spin up to the maximum total bet of $75 per spin. Metal Detector is great for casual players and high rollers as well. An autoplay mode is available for real money players only. To play all 15 paylines at 5 coins per line, hit the “Bet Max” button. For other wagers on the Metal Detector slot game, hit the “Spin” button. The highest paying symbol on the Metal Detector video slot is the Treasure Chest symbol. If you hit 5 Treasure Chest symbols on a selected payline, you will win the 2000 coin top jackpot. The Gold Coin and Diamond Ring symbols are also high paying symbols on the Metal Detector video slot, paying up to 1000 coins each. The scatter symbol on the Metal Detector slot game is the Treasure Map symbol. 2 Treasure Map symbols will pay out 1X your total bet. 3 or more Scattered Treasure Map symbols will trigger the Buried Treasure bonus game where you can win free spins with a multiplier. In this bonus game, you will first choose a red “X” to determine where to dig. This will award you with your number of free spins. Next, you will get the choice of 1 of 4 locations to dig to determine your multiplier for the free spins feature. Once you have made your choices, the free spins feature will commence! The Metal Detector free spins feature will lead you to finding your treasure when you play at Rockbet Casino! If you hit 3 Detector Dude bonus symbols anywhere on the reels, you will trigger the Metal Detector bonus game. Use the red arrows to walk along the beach to find a signal from the metal detector. When you get a strong signal, hit the “Dig” button to find your cash prize. To see what the Metal Detector bonus game looks like, a screenshot of the bonus game is below. All wins pay left to right, except scatter symbols (which pay any). Bonus wins are added to payline wins. 3, 4 or 5 Treasure Map symbols will trigger the free spins feature. 3, 4 or 5 Detector Dude symbols will trigger a dig bonus feature. An autoplay mode is available for real money players. Metal Detector is fun, but it’s not Rival’s best video slot. It doesn’t approach the greatness of some of their iSlots such as Psychedelic Sixties. With that in mind, the bonus game and free spins feature are not extremely difficult to trigger, so that works in Metal Detector’s favour. To try and search for your buried treasure, you can do so with a $100 no deposit bonus from Rockbet Casino! Are USA players able to play the Metal Detector online slot for real money? Where can I get a no deposit free cash bonus to try Metal Detector out? You can get a $100 free cash bonus with no deposit required at Rockbet Casino or you can also check out Pantasia Casino to get a $15 free no deposit bonus. Where can I play a free Metal Detector Flash game? 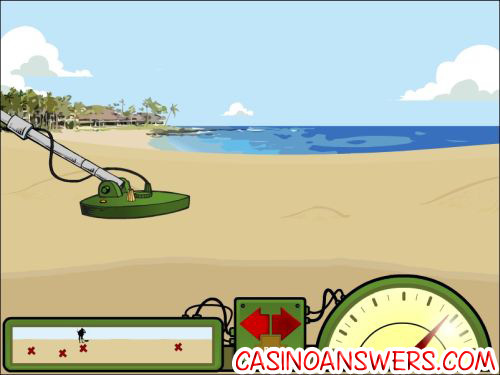 You can play an Instant Play version of Metal Detector at either Rockbet Casino or Pantasia Casino. You are welcome to play for free or for real money. If you experience difficulties with the Instant Play casinos, we suggest making sure you have the latest version of Adobe Flash Player installed on your computer.